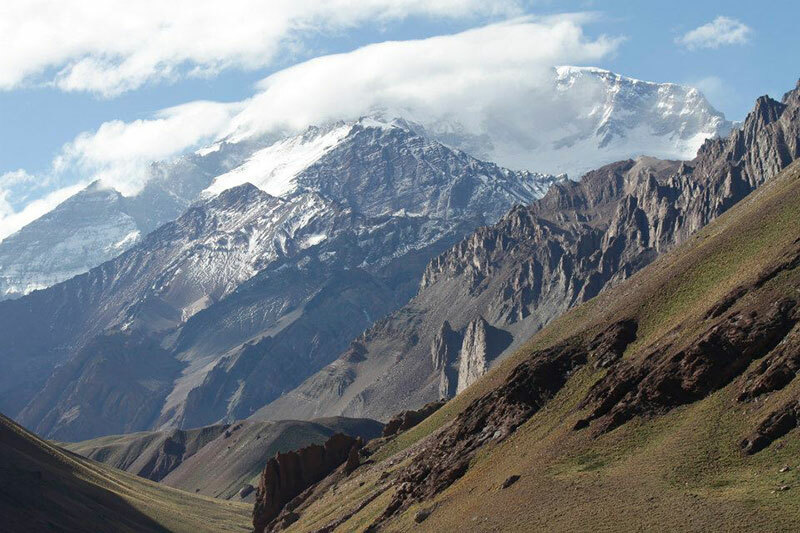 Want to learn more about climbing Aconcagua, the highest mountain in South America? Contact us today and we will give you all the info you need. 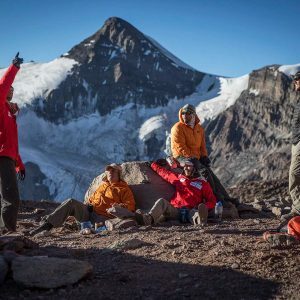 Our expeditions will utilize 3 camps on Aconcagua. Our recent experience shows that adding a third, higher camp will greatly increase the summit chances for all climbers. We will use the normal route variation which includes a high camp 3 at the Colera (19,500 ft., 5943m). After climbing the normal route and reaching the summit, our team will return to high camp for rest before descending the normal route into the Plaze de Mulas Base Camp. 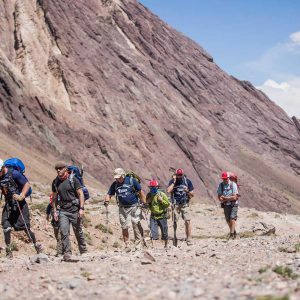 Aconcagua offers mountaineers and fit adventurers the chance to climb on a big mountain expedition in a relatively short period of time. We climb a (non technical) route allowing climbers to gain high altitude experience on a route which can be relatively safe from objective dangers. 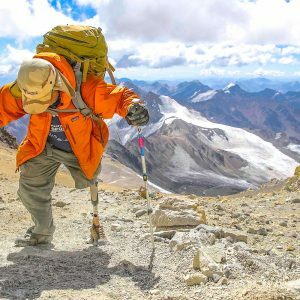 Climbers can concentrate on testing their own high altitude ability and many will use this climb as a stepping stone to additional mountain objectives. Mountain Professionals is in a strategic position to offer over 16 years of experience leading expeditions to the summit of Aconcagua. Our senior guides have lived and worked in Argentina for many years and have developed an all around fantastic trip to climb Aconcagua. From our very comfortable hotels to the private transports and superb base camp meals, we have fine tuned each and every detail along the way for a seamless experience. While at base camp, we enjoy a comfortable dining tent with table and chairs, each meal is cooked by our local staff including fresh bread, meat, vegetables, deserts and more. 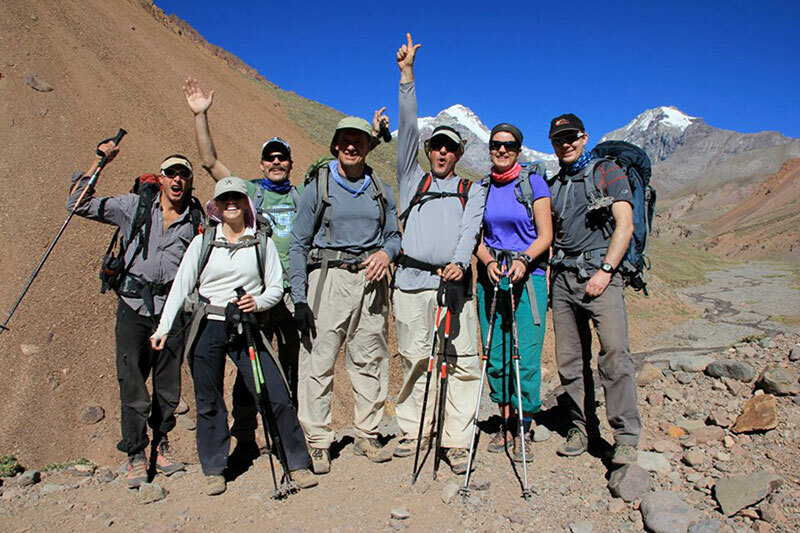 Our expeditions to Aconcagua are limited to 8 clients, ensuring a small team, personalized feel to each trip we run. 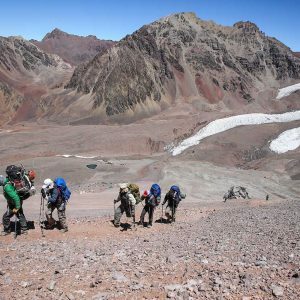 We invite you to join a Mountain Professionals Aconcagua expedition and experience the best all around trip available. The entire trip was simply awesome! 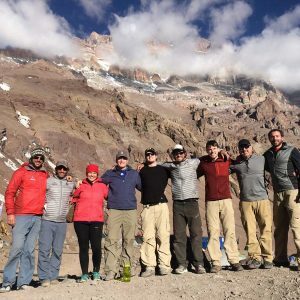 Ryan and Dave did an incredible job from the very beginning; Aconcagua was my 17th climb in the past year and from the get go I could tell that they were very professional and knew exactly what they were doing. I know I’ll be climbing again with them soon! Cerro Aconcagua is the highest mountain in the world outside the Himalayas. It stands as the highest peak in South America and one of the 7 summits or the highest mountain on each continent. Preparation: Our expedition to Aconcagua climbs a route that is not technical in nature, however it is a big undertaking. There are long days and the weather can be extreme in this unique environment. Our goal on the trip is to be safe and have fun on the mountain. So arriving with a good attitude and in good shape makes things a whole lot more enjoyable. 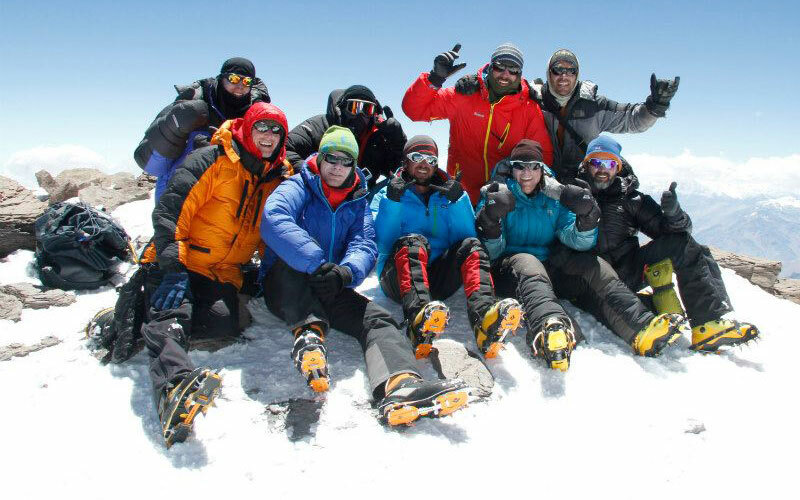 Training for a big mountain expedition is important and we work with you on an individual contact basis for several months in advance of the trip to suggest a program. Prerequisites: Team members should have a basic understanding of mountain expedition living that could include a previous mountaineering course and/or climb of a lower elevation mountain. We recommend experience walking in crampons and use of an ice axe. You should also have previous high altitude experience that could include an ascent or two of mountains such as Rainier, Shasta, Mt. Blanc, Mexican Volcano summit or other comparable high altitude climbing experience. You should also be in excellent physical condition. I have never had more confidence in any ones abilities than in Ted Alexander’s. 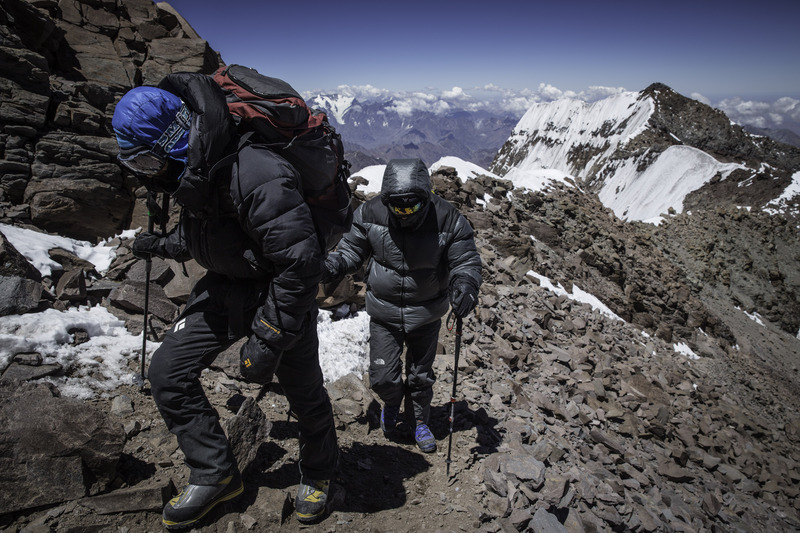 The summit of Aconcagua was a long trip in difficult conditions, being able to see all the way to the Pacific made every step worthwhile. Day 1: Arrive in Mendoza and met by our staff for transport to our hotel. Evening meeting, gear check, change money, group dinner. Day 2: Finalize any details and guide purchase climbing permits for you at the Permit Office in Mendoza. Private transport to Penitents and sleep in hotel. Day 3: Drive to Punta del Inca trailhead and begin hike. Walk approximately 4 hours to Confluencia Camp. Easy trail walking and mules carry our baggage each day to basecamp. 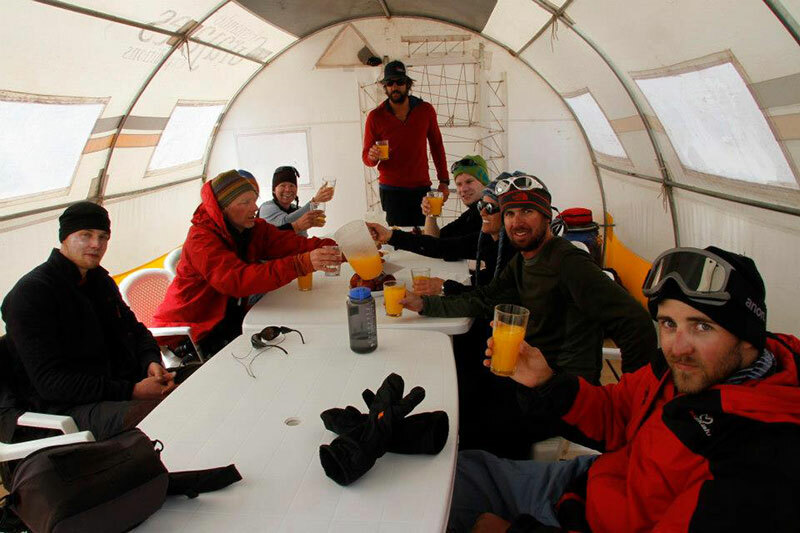 Day 4: Rest day and acclimatization in Confluencia Camp. Walk for approximately 7 hours to Plaza de Mulas Base Camp. Easy trail walking. Day 5: Walk for approximately 7 hours to Plaza de Mulas Base Camp. Easy trail walking. Day 6: Rest Day in Basecamp. Plaza de Mulas (4000m). Day 7: Carry loads for acclimatization to Camp 1 (Camp Canada) 5000m walking on scree and ice mixed with rock. 4-6 hours. Return to basecamp. Day 8: Rest day in basecamp. Day 9: Move to camp 1. Day 10: Carry loads for acclimatization to camp 2 (Camp Nido Condores) walking on scree and ice or snow. 6 hours. Return to camp 1 to sleep. Day 11: Return climb to camp 2. Move into camp. Day 12: Rest Day in Camp 2. Day 13: Move to Camp 3 at Colera Camp (19,500 ft./5943m). Day 14: Climb the switchbacks of rock and snow up the normal route to Independencia Hut and continue up through the Canaleta to the summit (6962m). Return to High Camp for sleep. Day 17: Descend to Plaza de Mulas basecamp. 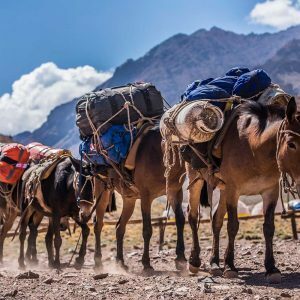 Day 18: Hike out the Horcones Valley to Punta del Inca gate and transport to Penitentes and transport on to Mendoza for Celebration. Hotel Night. Day 19: Departure flight day to home country (Return Flight). Transfer from airport to our hotel. Hotel Diplomatic (5 star) in Mendoza (double occupancy) for two nights. Private team transfer to and from Pentitentes. Full mountain services, meals, group equipment, tents. Shared Porter service for group gear at each climbing day and from Camp 3 down after summit. Full basecamp services with a heated and carpeted dome dining tent, basecamp cook staff, available Wifi. Access to solar panel and satellite phone. Daily dispatches from the team. Helicopter depature from Base Camp available for a fee. Items of a personal nature, individual travel costs, delays, taxis, etc. 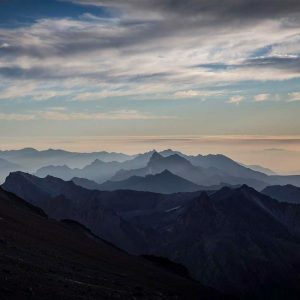 Personal Climbing Permit Fee paid in Mendoza with your guide (Approx. $650 usd based on 2018 pricing). Alcoholic drinks and personal snacks or drinks.